Buick headed into the 2011 Detroit Auto Show with a bright outlook for the new year, supported by strong sales throughout 2010 and the unveiling of the new c-segment luxury sedan – the Buick Verano. The new Buick Verano was the key attraction at the 2011 Detroit Auto Show from the GM affordable luxury marquee, drawing much of its architecture from the 2011 Chevrolet Cruze but coming with styling (inside and out) that clearly sets it apart from the Chevy. The Verano will also share an engine lineup with the Buick Regal and not the Cruze from which it receives its chassis design as a further effort to differentiate the two small sedans. General Motors has been criticized for rebadging in the past but the new Buick Verano is much more than just a Chevy Cruze wearing Buick badges. In addition to the new Verano, Buick brought out the new Regal, Enclave and LaCrosse – with a look at the upcoming LaCrosse eAssist. This luxury hybrid uses a 2.4L Ecotec engine and an electric engine to boost fuel economy to 25mpg around town and 37 on the highway, with regenerative braking and auto engine shut-off furthering the improved fuel economy. Finally, the Regal GS was once again on the pedestal but unlike last year, this time we are looking at a car that is bound for production. Powered by a turbocharged 2.0L engine making 255hp and 295lb-ft of torque mated to a 6-speed manual transmission, this new Buick offers improved performance and exterior changes from the standard Regal to help the GS model stand apart in a crowd. The new Regal provides the Buick brand with one more popular, well engineered model to help continue their upwards sales trend and the new Regal GS will help bring the Regal to the forefront of efficient performance. Buick has come a long way since the beige, uber-bland grandpa sedans of the 1990s and their display at the 2011 Detroit Auto Show is proof that Buick can continue to expect positive results with these new models. 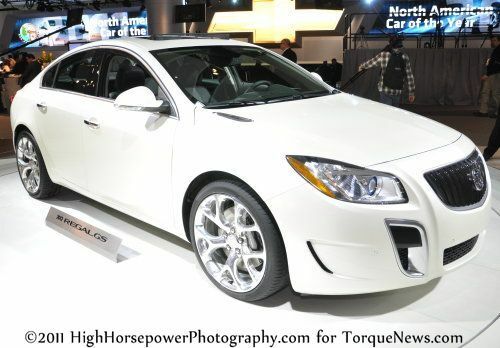 Check out the gallery below for a closer look at just a few of the Buick models from the 2011 Detroit Auto Show and the links below include more information on the new era of the Buick brand.